These shirts are great for student groups, events, outdoor sports, and promotional items. At 6.1 oz, they are a heavier weight, durable, and budget friendly. These shirts are generally softer, thinner, and more fitted than a standard t-shirt. Note: women's t-shirts run small. In addition to being softer, thinner, and fitted, they are crafted with higher quality material. The best way we could describe this tier of garments is: very nice. Note: women's t-shirts run small. 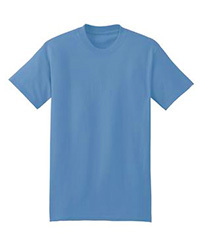 100 % Cotton Essential T-Shirt - PC61.